Your employees might work directly for you on activities needed to run your company (such as preparing customer invoices or entering accounting information into QuickBooks Online), and they might also perform work directly related to your customers. In the latter case, you might want to track the time employees spend on client-related projects and then bill your customers for your employees’ time. 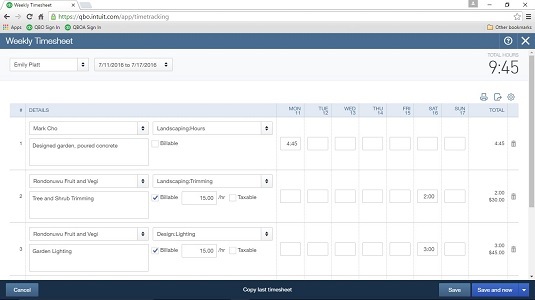 To track time, you use either the Time Activity window or the Weekly Timesheet window; regardless of the window you use, QBO tracks the time entered and, when you prepare an invoice for a client for whom time was recorded, QBO prompts you to add the time to the invoice. You’ll learn to enter time using both the Time Activity window and the Weekly Timesheet window, and you’ll see how QBO prompts you to include the billable time on a customer’s invoice. Note that a time entry that you can bill back to a customer is called, cleverly, billable time. Click the Create plus (+) sign button to open the Create menu. In the Employees column, click Single Time Activity. QBO displays the Time Activity window. From the Name list, select the employee or vendor who performed the work. Enter the date the work was performed. From the Customer list, select the customer for whom the work was performed. From the Service list, select the service that was performed. Place a check in the Billable box, which changes to the Bill At box, and supply an hourly rate. If the work performed is subject to tax, place a check in the Taxable box. In the Time box, enter the amount of time spent on this activity. You can enter start and end times, including any break time, by checking the Enter Start and End Times box; QBO calculates the time spent and displays it below the Description box. 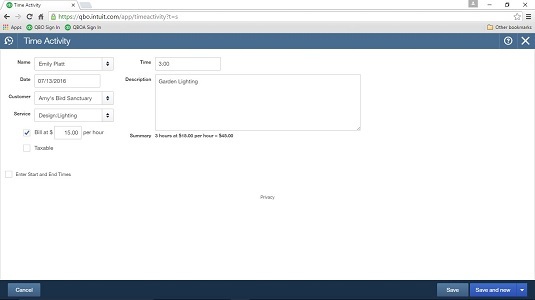 Enter a description of the work that will appear, by default, on an invoice. You can change the description after adding the time entry to the invoice. Click Save to save the entry or Save and New to enter another time activity. If you click the arrow beside Save and New, you can choose Save and Close. Click the Create button — the plus (+) sign — to open the Create menu. In the Employees column, click Weekly Timesheet. Select the name of the person whose time you’re recording. Select the week for which you want to record time. In the Details section, select a customer name, a service item, and, if appropriate, supply a description. To bill the time back to a customer, select the Billable check box and provide a rate at which to charge the time. Fill in the time worked on the appropriate day. Click Save, Save and New, or click the arrow beside Save and New and select Save and Close. You can add billable time entries to an invoice in a couple of ways. For example, if you view any customer’s page, QBO displays a list of outstanding transactions. In the Action column of any billable time entry, QBO displays a Start Invoice button that you can click to start an invoice to the customer and include the billable expense on the invoice. To view a customer’s page, click Customer in the Navigation bar and then click a customer’s name. But you don’t need to go looking for billable time entries. QBO prompts you to add them to any invoice you create for a customer for whom billable time entries exist. Start an invoice (from the Create menu — the plus sign — click Invoice) and select a customer. If the customer has billable time entries, they appear in the pane on the right side of the screen. Click the Add button in each billable time entry that you want to add to the invoice. Or, to add all the entries, click the Add All button at the top of the pane on the right. QBO enters each billable time entry’s information on a line on the invoice, filling in the service, description, quantity, rate, and total amount. You can edit any information on the line as needed. Fill in the rest of the invoice as you would any other invoice, adding other lines that might not pertain to time entries. Don’t forget that you can add a subtotal for time entries, if you choose.